This course shows you how to design, construct and manage a permaculture home garden that is productive, ‘eco-friendly’, organic, healthy and low maintenance. Learn about the basic concepts of permaculture as well as its design principles, systems, techniques and strategies and everything you need to know to create and enjoy your own permaculture home garden. 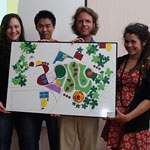 Permaculture Sydney Institute is Sydney’s leading Permaculture and sustainable learning centre. It provides cutting edge permaculture courses, workshops, inspirational experiences and quality information and training. Farmer of the Month: Louise Dragsund, Cosy Nook, St Albans.